Also known by the island's Italian name, Zante, Zakynthos sees a lot of tourist traffic on the south and east coasts. Aside from all of the tourism fuss, Zakynthos is at heart a stunningly beautiful island with crystal clear waters, sandy beaches and sprawling lush forestry. Smaller Zante towns can be found that remain remote and untouched by the sometimes unforgiving hand of tourism. The warm climate makes Zante the perfect place to relax, whether that's on a lounger by the pool, or on a towel on the beach. You can soak up some of the rays and read a book, before experiencing some authentic Greek cuisine in one of the many popular tavernas. If you're looking for trinkets or gifts to take home, then you won't be disappointed, as Zante isn't short of shopping opportunities. Roadside stalls sell homemade ceramics, and the smaller villages sell local produce for very reasonable prices. Zante also has a rich history, with many small museums dedicated to telling of the Greek island's past. The people of Zakynthos will enrichen your experience, with their helpful manner, and kind way of dealing with tourists. 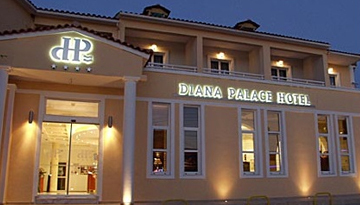 Diana Hotel Zakynthos offers a comfortable base with excellent services & tasty breakfast included. 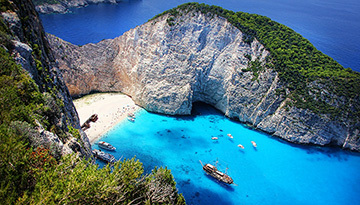 Fly from Gatwick - Zakynthos & Stay for 7 nights with 2 star accommodation. Bed & Breakfast.